Charles and Ray (born Bernice Alexandra Kaiser) Eames were not only married to one another, but were both devoted to clean, modern design. The two met in the early 1940s at Cranbrook Academy of Art (Michigan) where Charles was head of the Academy’s Experimental Design Workshop. They married and moved to Los Angeles. There, the couple closely worked together on progressive design in everything from architecture to furniture to film. They believed that good design could transform people’s lives, and they were socially conscious of all their aesthetic and material choices. The Work of Charles and Ray Eames: A Legacy of Invention from the Library of Congress is an online exhibit of the duo’s life and work. 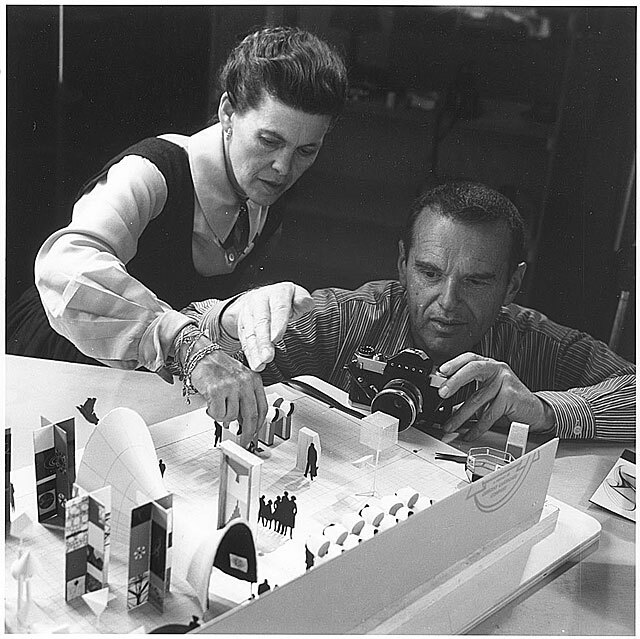 There are plenty of photos of the working couple, early designs and sketches, as well as their slide shows; the Eames had hundreds of slides that they used in lectures, providing insight into what shapes, forms, and textures inspired their work. Want to learn more about the awesome Eameses? Search the UArts Libraries catalog by subject for Eames. You can read their biographies in Design ProFILES (part of designinform) and Oxford Art Online, and you’ll also want to check out their films. Next Post Just for fun: the Cracker Jack man says read!